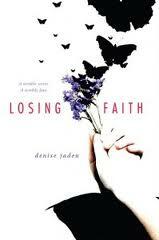 Losing Faith could probably be best described as Realistic YA ﻿Fiction. It is the sad story of a young girl who gets caught up in a supposedly harmless youth group at her church. This involvement gets extreme and deadly. The heart of the story is this young girl’s sister…Brie. She is determined to find out what really happened to her sister. She is facing this and the sadness and despair of her parents while trying to deal with her feelings about the loss of her sister. Brie is steadfast and determined to understand what happened to her sister and is relentless in her quest for the truth. Brie is not the best and kindest person before she loses her sister. As she works through the tumultuous aftermath of this tragedy everything in her life is forever changed. She loses old friends and gains a new friend in someone she would never have bothered with before. The book is not at all preachy but is just an awesome accounting of one of life’s tragedies and how one young girl deals with it. It has lots and lots of teen angst, some dark gothic characters, young love…and a bit of a surprise ending…all in all a yummy little book. I sped through it sort of nonstop!!! Great review! I read this one a while ago, and thought it was a yummy little book as well. Can't wait to read more by Denise!